Thank you for watching, and I’d love to hear from you! 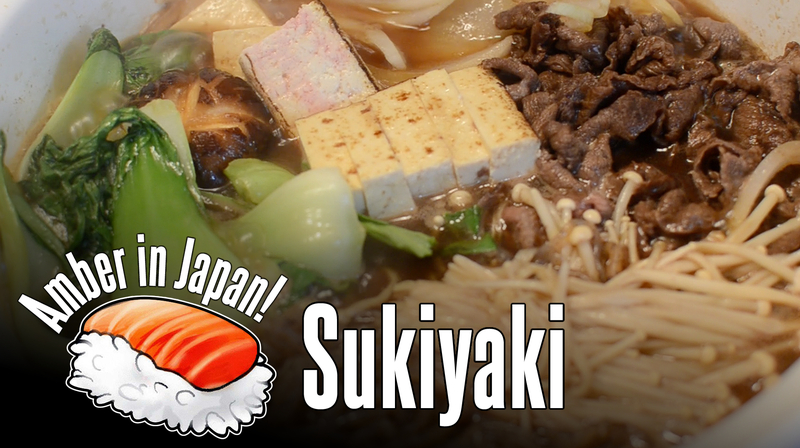 Sukiyaki is a delicious Japanese beef stew that you cook at the table as you eat. 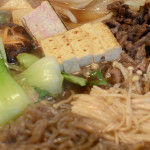 Thinly sliced beef, veggies, tofu, mochi, and mushrooms are cooked in a shallow pan by adding the ingredients one by one to the hot, bubbling broth. All the flavors come together beautifully, and it’s absolutely delicious! After I had it for the first time in Japan, I asked my nana to teach me how to make it. I was really surprised at how easy it is! Thank you, Nana! 1/2 cup/120 ml sake should be good enough to drink—for an adult, of course! Prepare the broth: Put all the broth ingredients plus 1/2 cup/120 ml of water into a saucepan and bring to a boil. Keep stirring until the sugar is dissolved. Lower the heat to low and keep at a simmer while you prepare the rest of your ingredients. Prepare the hot pot ingredients: Cut off the bottom of each baby bok choy; wash and separate the leaves. Clean the mushrooms. Trim the base of the enoki mushrooms and cut the stems off the shiitake mushrooms. Peel and cut the onion in half, then slice thinly into half-moons. Wash the tofu and slice into bite-size pieces. Submerge the shirataki in a saucepan of cold water. Bring to a boil, let boil for 4 minutes, and drain. The noodles are very long, so cut them shorter, using clean kitchen scissors. If the udon noodles are stiff and stuck together after taking them out of the packaging, submerge them in lukewarm water to break apart. Put all the prepped hot pot ingredients, plus the beef and mochi, in separate heaps on a large serving platter so everything is ready to cook. To cook: At the table, coat the bottom of your hot pot or electric skillet with oil and heat. Once it is hot, add some of the onion and sauté until translucent. Add some of the beef and let it brown. Pour in enough broth to almost cover the beef and onion. Move the beef and onion aside and add the shirataki, tofu, and mushrooms. Cover and cook until the veggies are tender. As the veggies and beef cook, they add to the flavor of the broth, which soaks into the food. Delicious! The udon and mochi tend to soak up a lot of liquid, so wait until the end of cooking to add those. Cook the mochi until it is super soft and gooey. You will need a spoon to scoop it out. As you cook, much of the liquid will evaporate, intensifying the flavor of the broth. Add water as you go to prevent it from becoming too strong. Feel free to add more mirin or sake to balance out the flavor as you like. Sukiyaki is eaten as its ingredients cook. To serve, scoop out of the pot and into your bowl whatever ingredients you want and drizzle the broth on top. Continue adding ingredients to the pot to cook until all of it is cooked and enjoyed by everyone.